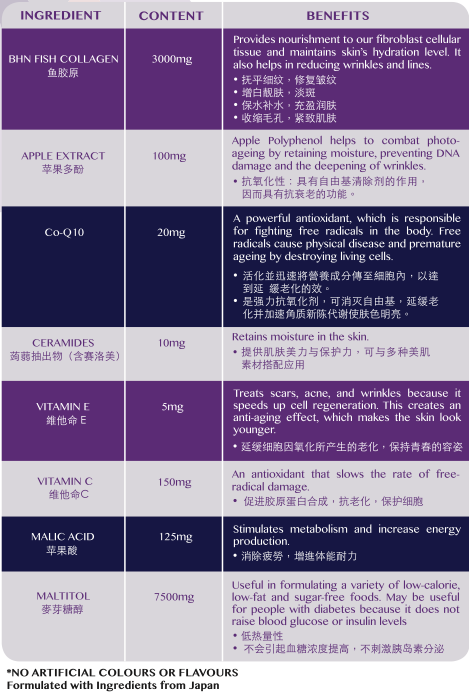 Description: Formulated with BHN (Marine) Collagen, enriched with Ceramide and Apple extract. 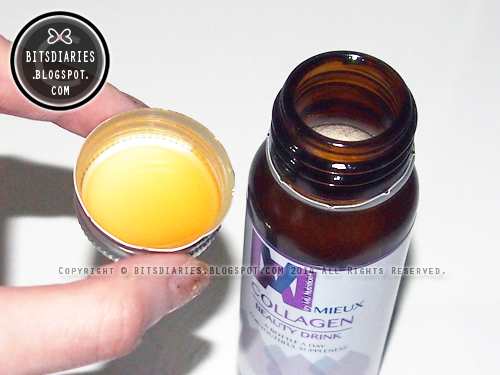 Every bottle of MIEUX contains 3000mg BHN Collagen and 10mg Ceramide. A bottle a day for youthful and supple skin! - BHN (Marine) low molecular collagen is proven in laboratory tests to be best absorbed by the body. It also provides nourishment to our fibroblast cellular tissue and maintains skin's hydration level. - Ceramide helps to lock in moisture in your skin by effectively rebuilding your skin's natural barrier to atmospheric hydration depletion. Usage: To maintain your skin's optimum collagen levels for youthful suppleness, consume one (1) bottle per day before bedtime. Shake well before consumption; consume the entire bottle upon opening. It is best served cold. Collagen is the most abundant protein in the human body needed to maintain the structure and density of your skin. Collagen proteins derived from fish contain high amounts of amino acids and peptides directly involved in the formation of collagen and elastin. Approximately 80% of young and healthy skin is made up of collagen. However, our skin gradually loses the ability to regenerate naturally and produces less collagen in our mid-30s, which resulting in the loss of firmness and the formation of wrinkles. Therefore, it is better to start taking Collagen early to prevent premature skin aging. 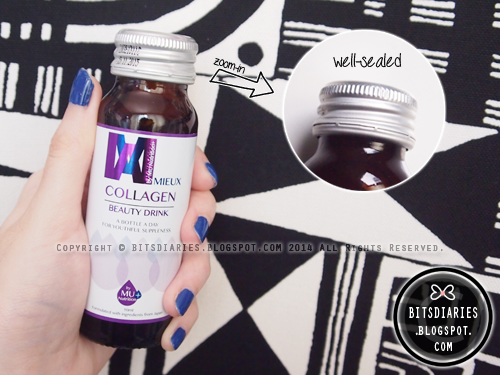 Here I have the MU Nutrition+ MIEUX Collagen Beauty Drink to the rescue! A revolutionary new line of nutrition dietary supplements developed by Mary Chia. 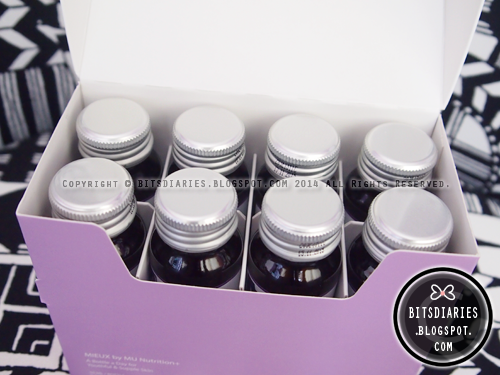 Each bottle is made of glass and is well-sealed with a screwed-off aluminum cap. It has a liquid texture but slightly denser than water. It has a hint of apple flavor, which actually tastes kind of pleasant to my taste buds, unlike some other brands which have a fishy taste. After drinking 7 bottles (= 7 days), I noticed that my pimples "ripe" (heal) faster than usual and my acne scars have lightened a bit. My skin also feels firmer, more hydrated, supple and radiant. However, the results may vary individually. Take note that other lifestyle habits such as diet, smoking of tobacco products and alcohol consumption as well as sleeping habits and exposure to UV rays play a part in the outcome too. All in all, it is indeed "A bottle a day for youthful and supple skin"! What are you waiting for? Start taking Collagen supplements today! MIEUX contains BHN Collagen which shows better absorption among Collagens with same molecular weight. Also, CoQ10, Ceramide and Vitamin C & E are added to the formulation for enhanced skin hydration, elasticity and luminosity. In addition, it contains NO artificial flavors yet it still tastes good. In fact, it tastes better than most brands in the market! 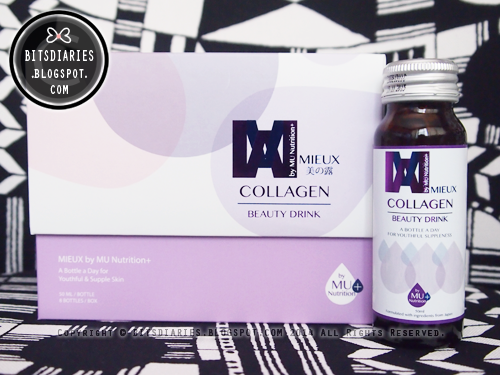 MU Nutrition+ MIEUX Collagen Beauty Drink is available at any Mary Chia and Urban Homme outlets. 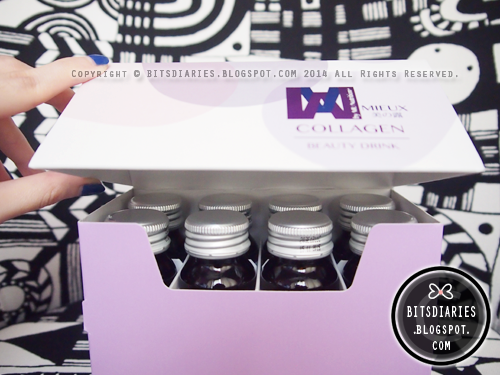 Get ONE (1) box of MU MIEUX Collagen Beauty Drink at only S$88 (UPS$108). BONUS PERKS! Complimentary Collagen Facial worth UPS$145/session for 1st 100 readers! In order to entitle to the above exclusive promo, all you have to do is to QUOTE 'Sample Store Exclusive' followed by 'BITSDIARIES Ashley Tay', call 1800 250 2001 for appointment and/or to reserve/redeem your MU MIEUX Collagen Beauty Drink~! Offers valid from 1st February to 31st March 2015, available at any Mary Chia and Urban Homme outlets.